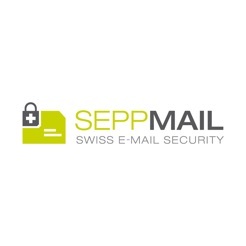 The official iApp of "SEPPmail AG" for decrypting "SEPPmail Gina"-E-mails on your iPhone or iPad. "SEPPmail iApp" enables the decryption of secure messages which have been encrypted with the "SEPPmail Gina" procedure and received on an iPhone or iPad. "SEPPmail Gina" is an innovative E-mail encryption procedure that has been invented by "SEPPmail AG". Procedure of "SEPPmail Gina" E-mails encrypted via a "SEPPmail" appliance are delivered to the recipient and saved to their mailbox (e.g. iPhone Mail). When the encrypted attachment is opened, it is transmitted back to the "SEPPmail" appliance via a secure SSL connection and, after the correct password is entered, it is shown in decrypted format. Two-Factor Authentication guarantees message confidentiality and protects e-mails against phishing attacks. "SEPPmail" stands for more than 10 years of experience in the field of secure messaging; the technological leadership resulting from this is recognized the world over. A "SEPPmail Gina"-E-mail message that has been decrypted by "SEPPmail iApp" remains active in the background and is therefore visible until "SEPPmail iApp" is terminated manually. Alternatively the browsers "Home" button within "SEPPmail iApp" can be pressed which will bring you back to the entry page. 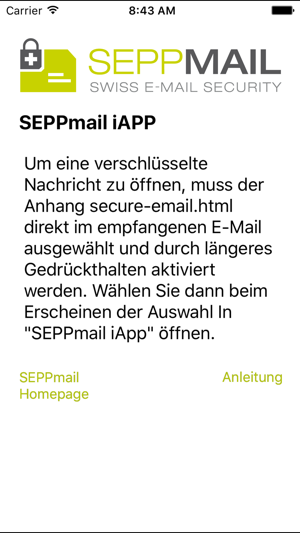 Please be aware that "SEPPmail iApp" has to upload the encrypted attachment of a "SEPPmail Gina"-E-mail in order to decrypt a secure message. Depending on the size of the WebMail the caused connection costs may vary. If a WiFi connection is available it will have precedence. Attention: when abroad "SEPPmail iApp" can cause high roaming costs. "SEPPmail iApp" has been carefully developed and implements the current technology standards for data encryption. Nonetheless the developer cannot guarantee that the "SEPPmail iApp" is not having any defects. Hereby the developer can neither be made responsible nor any kind of compensations can be claimed. This especially concerns the sensitive processes of decrypting a "SEPPmail Gina"-E-mail, the transfer of the encrypted data and the passwort input process. It is in the responsibility of every user to validate the displayed URL after every step of browsing during the decryption of a WebMail. By installing "SEPPmail iApp" you agree to these terms. Selbst der eine Stern ist zu viel. Bedienung zu unübersichtlich und auch viel zu aufwendig. Leider nutzen es die Unternehmen mit den ich arbeite und bin gezwungen es zu nutzen. Musste erstmal mich bei dem Unternehmen erkundigen ob es deren Mail war, leider wahr! Alles wegen der verdammten Datenschutzvereinbarung. Europa macht es nur komplizierter anstatt es einfacher zu machen, sehr schade! Leider ist einer meiner Dienstleister ein Kunde von Datev. Insofern bin ich gezwungen, diese Applikation zu benutzen. Selten so einen schlecht zu bedienenden und funktionsarmen E-Mail Client gesehen. Wahnsinn, was man heute als Software verkaufen kann. Passwort eingegeben, Passwort bestätigt, Mail gelesen. Soweit so gut. Später war kein einloggen mehr mehr möglich, Passwort vergessen Funktion nicht funktionsfähig, obiges Tool „Registerkarte“ ohne jegliche Funktion. App Note 6, setzen. Miserabel. In unser heutigen Zeit nicht akzeptabel!